Last year the week was held with various activities, including direct actions, talks, workshops and many other events, with the participation of groups from many countries including Germany, Finland, Israel, Russia, South Korea, the USA, and others. The events from last year followed the week of action held in 2016, 2015 and 2014, as well as a day of action held in 2013. Militaries, armed groups and others profiting from war have always found ways to access young people. Their aim is not only to recruit bodies, but also to recruit minds into their military cause. In some countries, the militarisation of youth is more apparent and obvious – young people (mainly, though not exclusively, young men) are forced to join the military through conscription. This might also include forced recruitment or recruitment of children. In many other places – including those places where conscription has been suspended or abolished - governments, arms dealers and other war profiteers have a vested interest in indoctrinating young people to be positive about military actions. As long as these efforts to recruit youth into violence continue, our actions to counter this militarisation need to grow. In the week of action, we will counter those many ways of recruitment that promote violence to youth, and engage them in war and military causes. Nonviolent direct actions: Examples from previous years include protests in front of military recruitment centres and job fairs attended by the military, and protests against arms fairs. Seminars, talks, workshops, public forums or webinars: Inform the public about your activism, key issues to focus, and encourage more people to take action against youth militarisation. Information stalls: Set up an information stall at your school, university or any other public space where you can reach the public, and circulate leaflets and other resources informing public about youth militarisation and resistance to it. 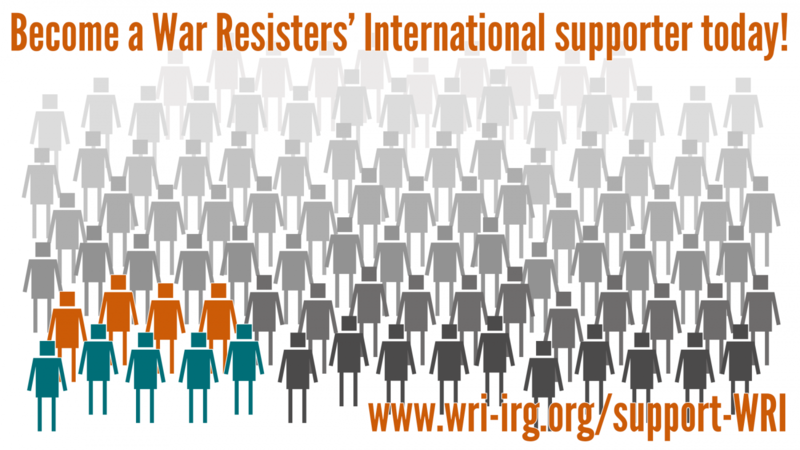 Get in touch with us via cmoy@wri-irg.org if you need resources. Movie screenings: You can screen movies that tell stories of youth militarisation and resistance to it. Online action: Post on social media with the hashtags #demilitarisedyouth and #weekofaction2018, share from your country or city and spread your word and resistance. Celebrate your previous work: If you've already been running a campaign, or already organised an action or event against youth militarisation during the year, we want to celebrate it with you! Tell us about your work, and we can post it on our website antimili-youth.net, and on social media. Spread your word and resistance further during our week of action! Publish articles and interviews about youth militarisation and/or resistance to it in your country, inform others and help us expand our international solidarity. See examples from last year here. Not sure what to do? Get in touch with us and we can discuss action ideas with you, or put you in touch with others in your country who are already planning something. Contact us at cmoy@wri-irg.org with your actions and events, or with any questions you have. Follow us on social media and www.antimili-youth.net for any further updates.